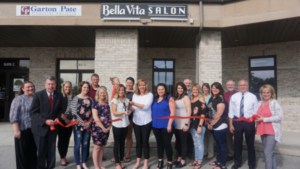 The Wells County Chamber of Commerce staff and Ambassadors welcomed co-owners Stacy Baller-Tam and Wendi Andrews of Bella Vita Salon to their new location at the Dutch Mill Plaza, 360 N Main St in Bluffton, with a Ribbon Cutting on May 22. Baller-Tam and Andrews are thankful for the outpour of community support. “We are truly grateful to be here in the heart of Bluffton, surrounded by so many wonderful established and growing businesses,” said Andrews. A grand opening celebration is scheduled for Wednesday, May 30 from 5pm-7pm. Hot dogs, hamburgers, drinks and giveaways will be provided for the community to see the new location and meet the stylists.